Arms collectors often confine themselves to studying weapons only made by and for their culture of interest. This leads to somewhat of a paradox, because the elites of these very cultures tended to have a keen interest in the foreign and exotic. The connoisseur who neglects such items, in my opinion, does himself a disservice, because much beauty and history can be found in artifacts that were produced through cultural exchanges. Today lies before me a nice example of such an item in the form of a typical Ottoman styled bichaq knife. It is of very fine workmanship, of a style commonly produced in Ottoman Greece and the Balkans, but made in Paris. France has long held close diplomatic ties to the Ottoman Empire, starting with establishment of an alliance between the French king Francis I and Ottoman sultan Suleiman the Magnificent as early as 1536. In the 19th century there remained a market for such exclusive items as presents for diplomats, or for wealthy travelers with Ottoman tastes. A very fine knife in the style of those made in the Ottoman-controlled areas of the Balkans and Greece, but, dare I say it, this piece is of far better quality manufacture than the vast majority of locally made ones. The blade is of the characteristic Ottoman form with slightly hollow edge profile, like the larger yagathan swords. Adhering strongly to that tradition, it has a T-shaped spine, reinforcing the blade. It is forged out of a very fine "damascus" pattern-welded steel made with laminated rods that were twisted, welded together and subsequently ground to their cores to reveal the twirling patterns you see. This laborious process leads to a very flamboyant and active pattern, known as "Turkish ribbon" among collectors of Ottoman arms. Not at all common on edged weapons of the day in Europe, this forging method was most certainly used to appeal to the Eastern market. 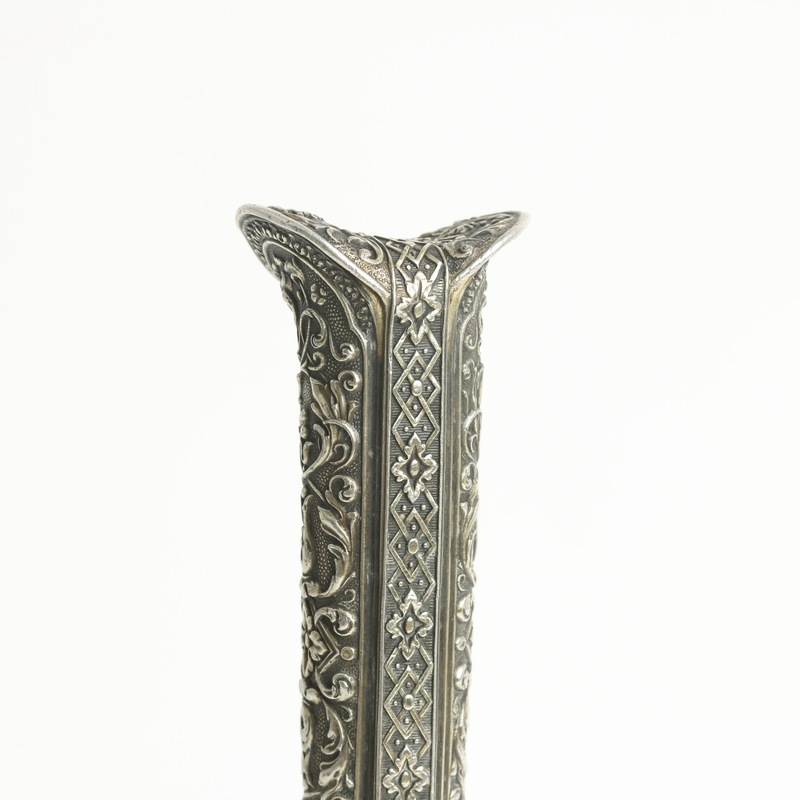 The hilt and scabbard are both made of wood, covered with silver sheet. The silver is worked in both great detail and high relief creating motifs that are raised high over a blackened, stippled background. The quality is very consistent throughout, flawless in its execution. The style is an accomplished mix between European and Ottoman aesthetics, with acanthus leaves, honeysuckle flowers, rosettes, shells and complex tendrils. 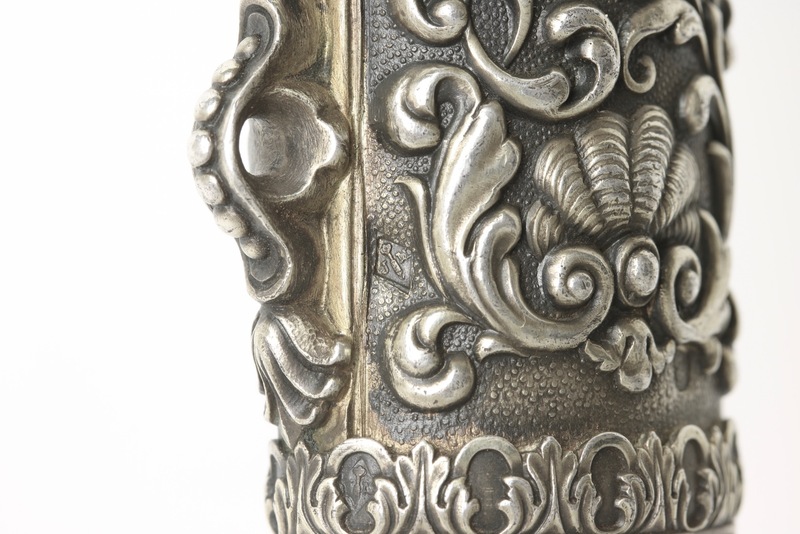 The top of the scabbard is decorated with bands of braided silver, very much in the traditional Ottoman fashion. 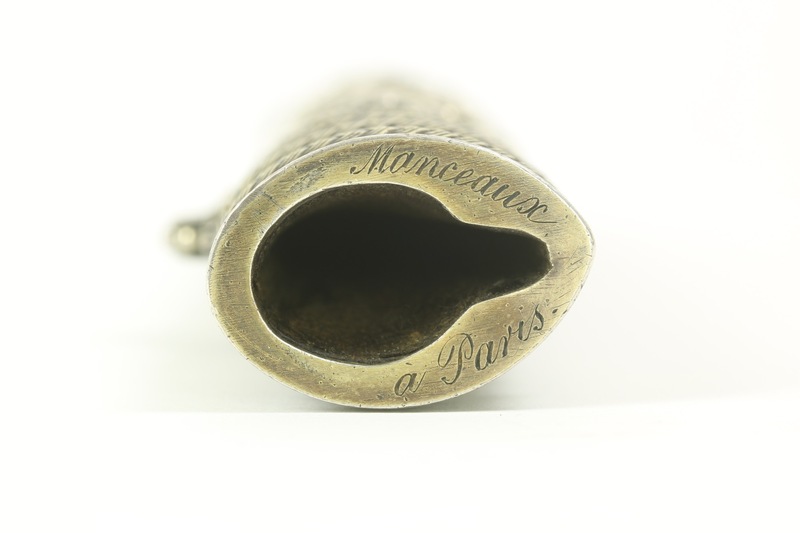 Engraved around the opening of the scabbard is Manceaux à Paris , a notable arms manufacturing company. 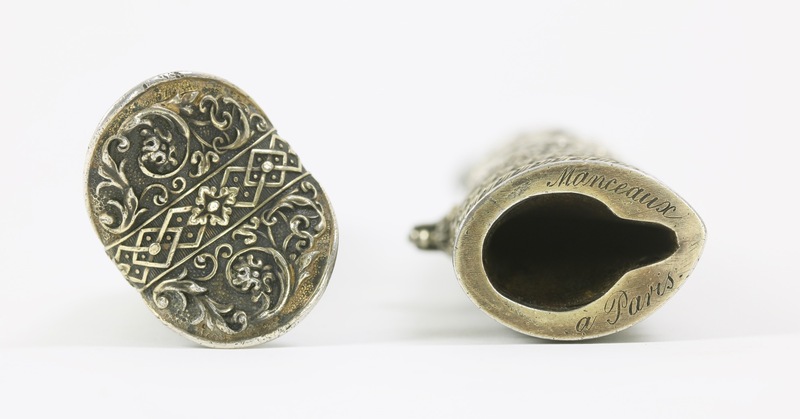 The silverwork also bears four tiny stamped marks, two on the scabbard and two on the handle. Each part has a stamp with the head of Minerva and the number 1, a mark denoting the highest grade silver was used. The mark is of the type that was in use from 1838 onwards. The other mark is a lozenge, the typical form of French maker's marks at the time, with the initials J.M. and a logo that looks like a royal scepter. 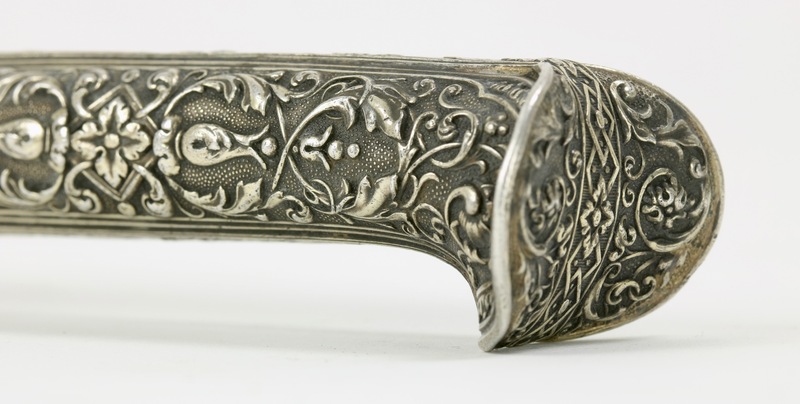 This is probably the mark of the individual silversmith who did the silverwork on this piece. I currently know of at least two generations, Joseph-Francois Manceaux and his son Francois Jules Manceaux. Both father and son successfully applied for several patents to the design of arms and armor, from scabbards to breech loading firing mechanisms and helmets. Originally from Versailles, they set up shop in Paris around 1806. Apart from innovation and manufacture of arms, Joseph-Francois Manceaux operated a depot in Paris for the Klingenthal factory. 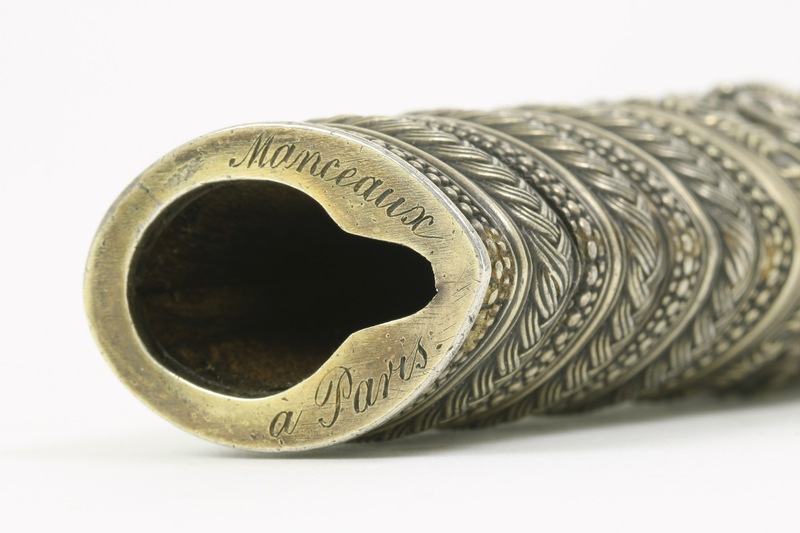 Manceaux held the sole productions rights for a saber of distinction awarded to graduating students of the prestigious École Spéciale Militaire in Saint-Cyr from 1822. From 1838 to 1872 Francois Jules Manceaux did work for the king's workshops, the Royal Manufacture d'Armes in Tulle. Various lavish examples of presentation pieces by Manceaux are known to exist, mostly made in the 1830's and 1840's. One of the more notable pieces he made was a set of pistols in box from the King of France to British naval hero Lord Cochrane, in 1843. It features the names of the King, the receiver, and the maker Manceaux, suggesting he was of considerable repute at the time. 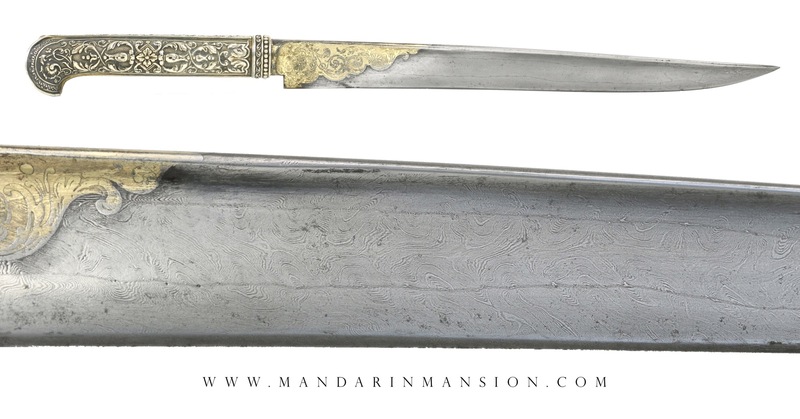 While their many patents seem to point to a keen interest in innovating on modern warfare, Monceaux's presentation arms manufacturing side of the business seemed to have specialized for a large part in producing items with Ottoman aesthetics, intended for an eastern market, with several nearly identical sabers and knives being in existence. In very good condition throughout. One minor dent at the scabbard's finial, and one of the ears of the handle is dented. Some minor wear to the gold on the forte of the blade. Otherwise nearly flawless. See photos. 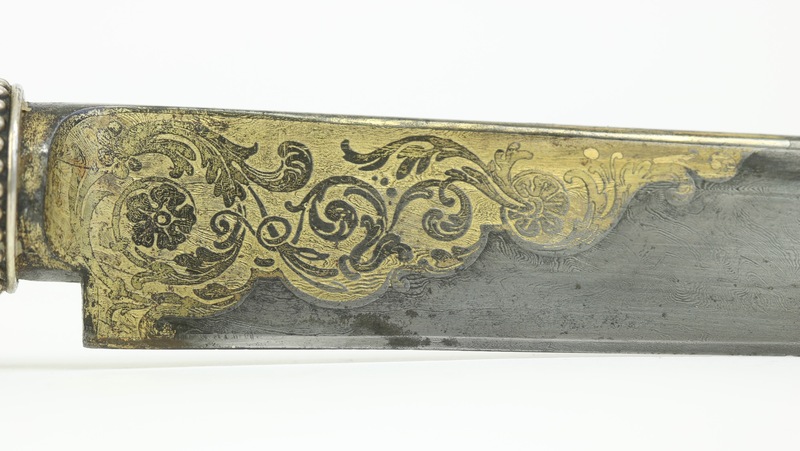 An exceptional knife made by the famous workshops of Manceaux of Paris who made many presentation pieces for notable people, including no less than the King of France himself. 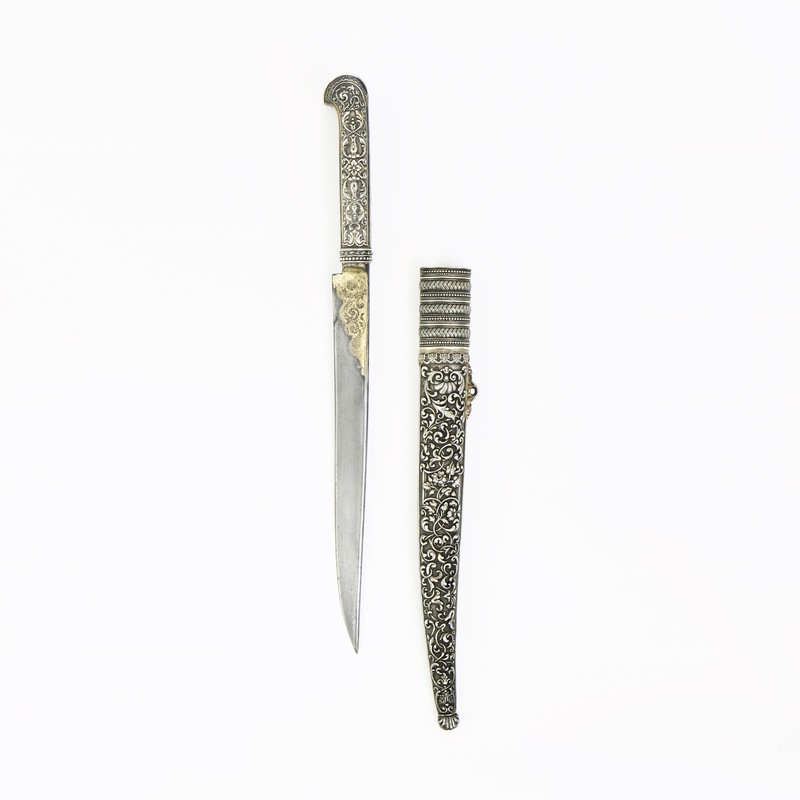 These knives were perhaps made for the same purpose, as presents to Ottoman dignitaries, or otherwise to be sold directly to wealthy individuals in the Ottoman empire. The whole displays considerable sensibility for the aesthetics of that target audience: The overall geometry of the piece is nicely in proportion and in all aspects purely Ottoman. And while the design has some European influence, it doesn't immediately scream "European". A very fine piece, representing the highest quality manufacture of this particular style of knife. When the Monceaux were not coming up with new patents, some 20 held by Francois Jules Monceaux alone, they seemed to manufactured presentation arms. A large part of these were items made with Ottoman aesthetics, often for an Ottoman or North African market. 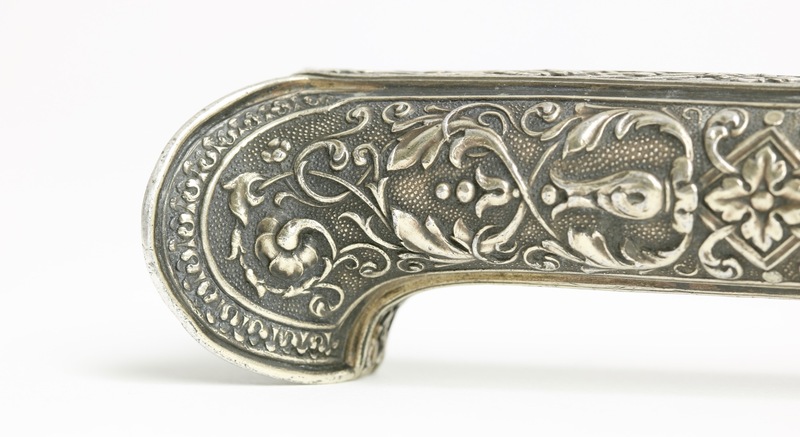 A magnificent set of presentation pistols by Manceaux were listed in the September 11 sale of Rock Island Auctions. They were made on order of Louis Philippe, King of France, for presentation to no less than Thomas Cochrane, in 1843. Cochrane was a remarkable figure and one of Britains greatest naval heroes. The set bears the names of the king, Cochrane, and Manceaux, illustrating just how high of standing Manceaux was in the presentation arms manufacturing scene. Another pair of presentation pistols by Manceaux was displayed in the 1988 exhibition in Paris named Splendeur des armes Orientales and published in their catalog. The lid of its box carries a brass plate with the text: " Le Prince L. Napoléon à Si Mohammed bel Heidie and the date of May 16, 1852. And finally, a presentation grade Dumonthier patent percussion pistol / dagger combination has turned up with Manceaux signature. It was sold by Thomas Del Mar Antique Arms, Armour & Militaria, London, Wednesday 29th June 2011. Lot 419. 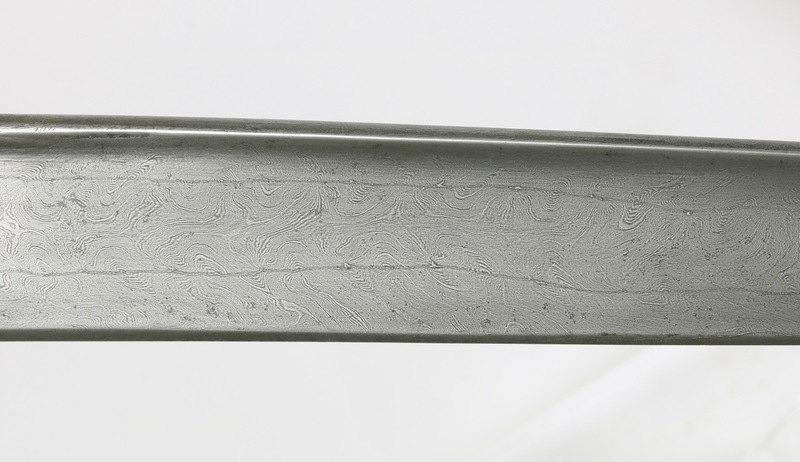 Silver clad Ottoman saber, dated 1827. 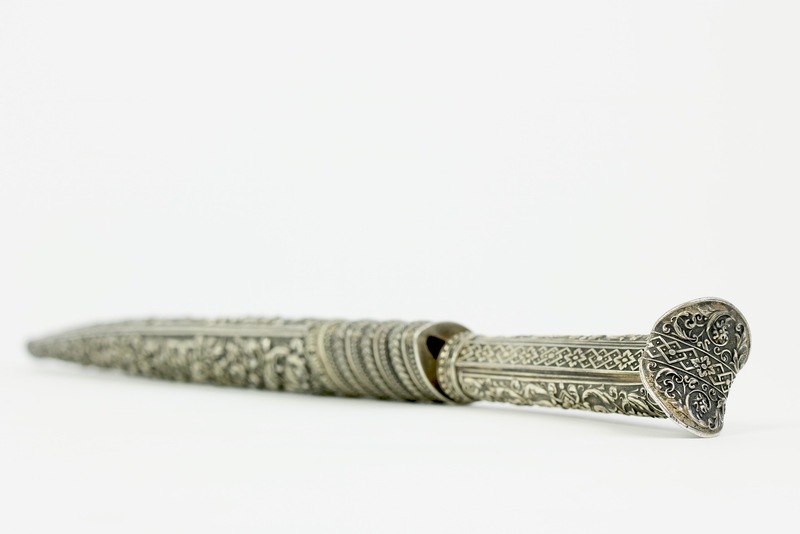 Silver clad Ottoman saber, dated 1839. 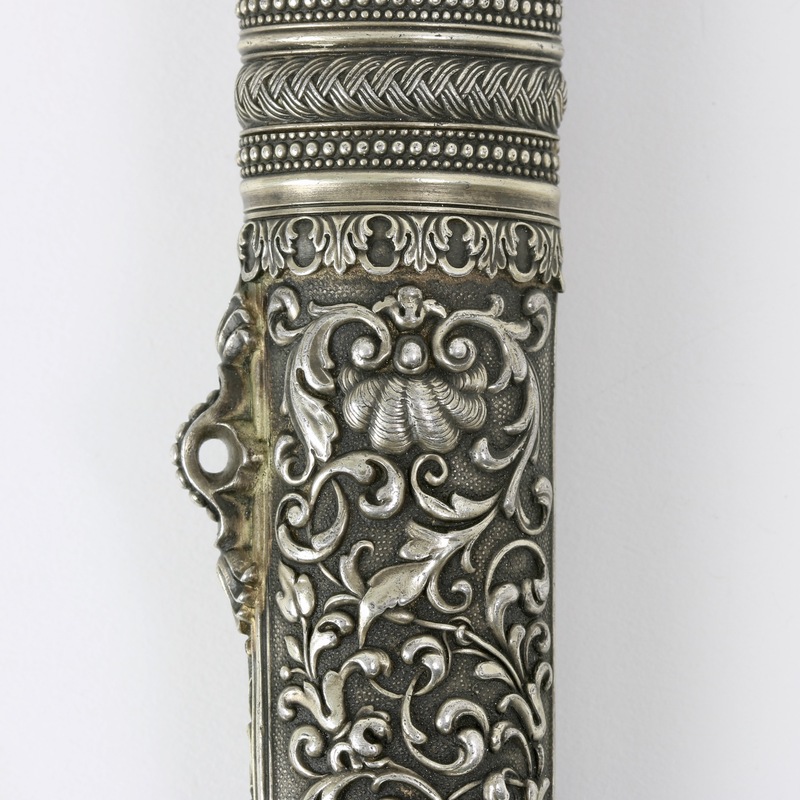 Silver clad Ottoman saber, presented 1847. Silver clad Ottoman saber, undated. An identical saber, possibly without date, is held in the Wallace Collection in London, accession number OA1752. A wonderful piece with silver mounts set with coral and turquaises. This piece was sold by Bonhams for €11.100 in their target="_blank">Antique arms and Armour sale of November 30, 2016. It is inscribed: " Fabriquée pour le prince d'Orange par Manceaux à Paris ". The Prince of Orange at the time was Willem Frederik George Lodewijk, (1792 - 1849), who would become king William II in 1840. It bears a silver mark that was only used from 1819-1838, framing its time of manufacture. Ottoman Bichaq style knife, gold. No date. 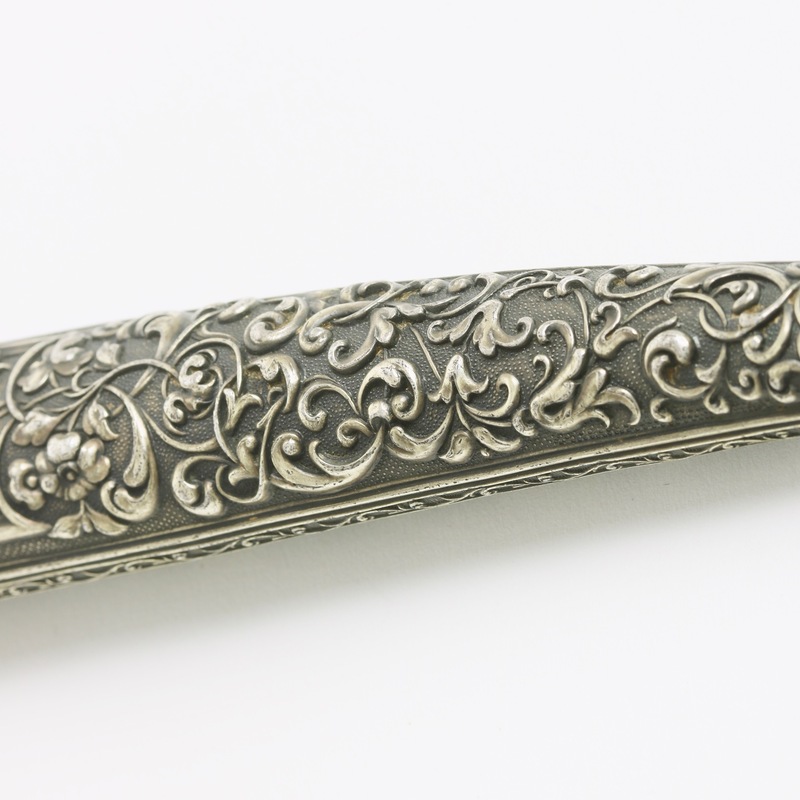 Ottoman Bichaq style knife, silver. No date. 1. Howard Ricketts, Phillippe Missilier; Splendeur des Armes Orientales , Paris: ACTE-EXPO, 1988. Page 52 and 168. 2. Arms and Armor: A Loan Exhibition from the Collection of Stephen V. Grancsay, With Important Contributions by the Metropolitan Museum of Art, New York, and the John Woodman Higgins Armory, Worcester, Massachusetts . Allentown Art Museum, 1964. Page 76 and 79. 3. Splendeur des Armes Orientales . Page 168. 4. Splendeur des Armes Orientales . Pages 53 and 168. 5. Splendeur des Armes Orientales . Pages 53 and 168.